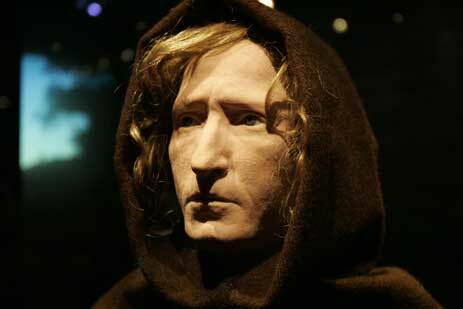 This man was murdered sometime between 1350 and 1370 A.D. The Bocksten Man (link is to Swedish Wikipedia entry), pictured above, was murdered and his body pinned down by three thick stakes of wood, two of them birch, and the third one—through the heart—of oak. It most likely wasn’t a robbery, since he was found carrying his knives and still wearing his expensive robe. The reason we know him is that his body was found in Bocksten, Sweden, having been preserved through the ages by his having been staked down in a bog which was then drained in 1936, when the remains where found. During the 14th century in Sweden, it was common practice to stake down the corpses of people you thought might come back to haunt you after death. Due to the fine clothing worn by the Bocksten Man, as well as his soft hands, the current best theory is that he was some sort of tax collector or military recruiter, and thus a person of influence whose silence, even in death, had to be ensured. As much as his resting place in the bog has preserved the Bocksten Man, there wasn’t much more than a skeleton and the fibers of the clothes he was wearing to go on when he was found. The picture you see above is the result of the work of doll maker Oscar Nilsson, who used skills from forensic investigations to recreate what the Bocksten Man probably looked like, based on the remains and the cultural circumstances during which he lived.